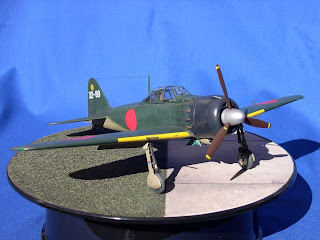 "This is the 1/48 Hasegawa A6M5 night fighter, built pretty much from the box, with small improvements and additions. 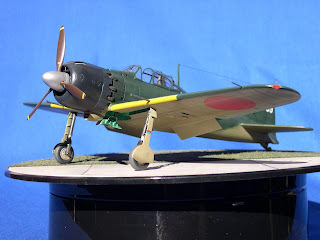 The kit instructions will have you build these aircraft, regardless of unit, as A6M5a, but close inspection of available photographs in publications such as Koku Fan #96 show that they were more than likely standard A6M5 variants. This particular aircraft, from the 332nd Kokutai based at Iwakuni, had non-standard antenna rigging, and what I chose to depict was based on a best guess from the few available photos. 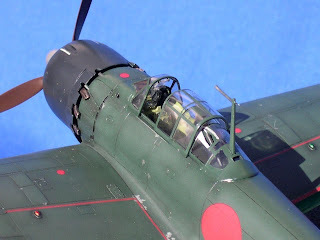 The aircraft used by the 302nd Kokutai at Atsugi in this role also sported different equipment, more than likely due to the loss of the loop antenna behind the pilot with the installation of the oblique weapon. The model was finished using Mr Color #15 for the upper surfaces (FS 14077), and a mix of Tamiya acrylics thinned with Mr Color lacquer thinner - XF-20 and XF-49 - to arrive at a variation of FS 24201 for the lower surfaces. 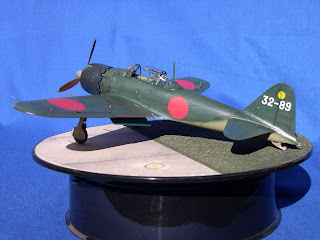 Tamiya XF-25, lightened with white, was used for the fabric surfaces, to replicate FS 16314. Nearly every A6M5 with an oblique cannon shows different metal work on the rear canopy, so close attention to detail on the specific aircraft you are building reaps benefits. The kit as molded is a good generalisation of what was seen on the various airframes." Thank you Ken...I appreciate that.